I’ve got some plants growing in the garden that I am pretty sure are tomatoes. I think they are because I grew tomatoes there last year and I left fruit behind. Plus they look like tomato seedlings. Still, I yanked them out. But that’s because I’m growing spinach in that bed this year. I spared a few of the hardier ones and potted them. If they turn out to be the real thing, I’ve got extras. But I’m still wary. I’ve been burned by look-a-likes before. Years ago I planted June-bearing strawberries next to Ever-bearing ones. 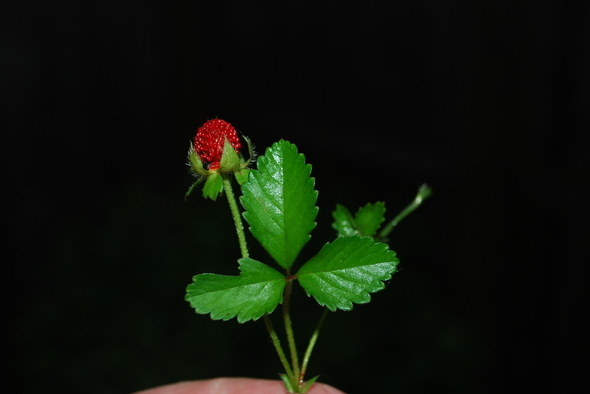 Turned out the Ever-bearing strawberries were Barren strawberries, a wild plant that grows here in Michigan. It took me two years to root them all out and there are still more growing in a field behind the house. It is the evil twin of the sweet strawberry that experienced gardeners recognize immediately and weed out. And that got me to thinking about the problem of the evil twin/look-a-like in literature. Fooling a novice or a stranger that a character is who they pretend to be is fine. But, fooling a spouse of loved one is just plain stupid. Many years ago I led a youth group at my church that met in a cavernous room on an upper floor. Nearly every one of the girls in the group could tell who was walking up the stairs by the sound off their footsteps and they got it right every time. Even if it was a group of kids coming up, they could discern each pattern in seconds and call them out by name. Identifying a person by just the sounds of their steps on a set of stairs was beyond my sensory perception, but not by your average fourteen year-old girl. I could. however identify a co-worker from half a mile away, in the dark, by the way they guided in an aircraft (I work at an airport by-the-way). It manner in witch the lighted-wands moved was ad individual as fingerprints. This is why I can’t stand TV shows, movies or books that show a husband totally fooled by a look-a-like. It doesn’t work in the real world, it shouldn’t work in fiction. As writers we need to weed out the tired memes that wouldn’t fool a fourteen year-old. We need to kill off the evil twins.